The role of the anesthesiologist in the care of patients undergoing cardiovascular surgery is to provide continual medical assessment during the perioperative period. This involves regulating vital organ functions and controlling pain and the level of consciousness to make conditions ideal for safe and successful surgery. Despite a decline in operative mortality rates for patients undergoing cardiac surgery, neurocognitive impairment still occurs after cardiopulmonary bypass. The incidence of subtle signs of impaired performance ranges from 60 to 80%,1 and poor neurological outcomes are associated with higher rates of morbidity and mortality. Brain injury is thought to result from cerebral ischemia during cardiopulmonary bypass, which may be a result of arterial embolism,1 global hypoperfusion of the brain,2 an interaction of the two,3 alterations of neurochemical or immune activity, or other factors. Anesthesiologists at Mount Sinai are exploring ways to improve neurological outcomes in patients undergoing cardiac surgery. 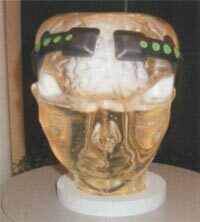 Among the methods under investigation to monitor cerebral perfusion is cerebral oximetry. 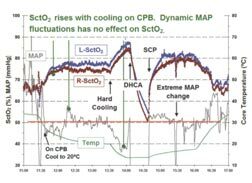 This technology is based on near infra-red spectroscopy (NIRS) to detect changes in tissue oxygenation at the microcirculatory level, based on the absorption characteristics of the chromophores oxyhemoglobin (HbO2) and deoxyhemoglobin (Hb) in the near-infrared spectrum (Figure 1). A "biological spectroscopic window" exists at the wavelength range 660-940 nm because only a few chromophores like Hb and HbO2 strongly absorb light in this range, allowing light to penetrate tissue to a greater distance. 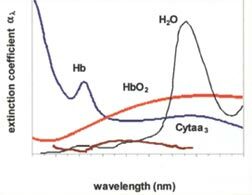 In this range, absorption of light by water, lipids, skin and bone are lower and generally spectrally flat compared to Hb, HbO2, and other chromophores. Cerebral oximetry measures cerebral tissue oxygen saturation (SctO2), a mixed oxygen saturation parameter that lies between arterial (SaO2) and jugular venous oxygen saturation (SjvO2) under normal physiological conditions. Complementary to SaO2, SctO2 reflects regional cerebral metabolism and the balance of cerebral oxygen supply and demand. The measurement is noninvasive and continuous. Cerebral oximetry provides information that other types of physiological cerebral monitoring, such as electroencephalography (EEG) or transcranial Doppler (TCD) flowmetry, cannot. Other modalities, like positron emission tomography (PET), CT angiography, and magnetic resonance imaging (MRI), provide detailed but semi-quantitative and momentary information about cerebral metabolism and perfusion and are not amenable to dynamic applications in the operating room. In the event of cerebral oxygen desaturation, there is a well established protocol aimed at increasing SctO2, which has been effective in routine applications of cerebral oximetry (Figure 3) for patients undergoing cardiac surgery (Figure2). Low SctO2may result from several pathological conditions. Among these are failure to maintain ventilation and systemic oxygenation, cardiac output, blood pressure or hemoglobin content. Figure 3: Typical pattern of Sct02 in a patient under-going aortic arch repair under deep hypothermic circulatory arrest (DHCA). Investigators at Mount Sinai are pioneering research efforts to evaluate cerebral oximetry, and emerging data suggest that monitoring and optimizing SctO2 has a favorable impact on neurocognitve outcomes after cardiac surgery. Someday this or similar methodology may become a standard component of perioperative care for patients undergoing procedures requiring cardiopulmonary bypass, but today its use is limited to a few centers. 1. Ergin MA, Galla 1D, Lansman SL, et al. Hypothermic circulatory arrest in operations on the thoracic aorta. Determinants of operative mortality and neurologic outcome. J Thorac Cardiovasc Surg 1994;107: 788. 2. Plestis KA, Gold JP Importance of blood pressure regulation in maintaining adequate tissue perfusion during cardiopulmonary bypass. Semin Thorac Cardiovasc Surg 2001;13:170-5. 3. Hagl C, Khaladj N, Karck M, et al. Hypothermic circulatory arrest during ascending and aortic arch surgery: the theoretical impact of different cerebral perfusion techniques and other methods of cerebral protection. Eur J Cardiothorac Surg Surg 2003; 24:371-378.